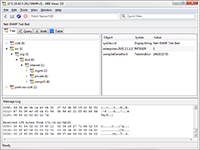 MIB Views - SNMP MIB Browser Tool Suite | Muonics, Inc.
MIB Views from Muonics, Inc. is an entry-level SNMP management application providing an easy to use tabbed interface with several SNMP Tools. The tools are based partly on those bundled in MIB Smithy, with a more consolidated GUI and new features. The suite includes MIB Browser (Tree View), SNMP Query, Table View, SNMP Walk and Trap Watch tools, with more tools and plugin features in the works. MIB Views supports SNMPv1, SNMPv2c and SNMPv3 with MD5 or SHA authentication and DES or AES encryption. Walk a specific subtree or an entire agent. Examine a table in whole or in part. Monitor incoming notifications (traps and inform requests). Manage multiple agents at the same time. Jump to desired data quickly with the web browser-like "goto" entry. Filter lists and tables instantly with substring matching. Other platforms are negotiable. Contact sales to discuss options.